Public storage is arguably the biggest and safest company to invest in within the self-storage REIT space. It has a recession resilient business model and the scale and balance sheet to keep costs low. It's fairly valued at the moment, and because of its defensive nature, we don't expect much upside if the economy keeps growing, but the dividend could increase a bit. Public storage owns 162 million square feet of 2,429 self-storage facilities and has a broad base of 1.4 million customers in the U.S. In several western European countries the company has developed the “Shurgard” brand with 12.6 million square feet and 232 storage facilities. Shurgard went public on Euronext Brussels stock exchange at 23 euros per share with a valuation of 2.04 billion euros in October 2018. By going public the company raised around 575 million euros and could use funds to acquire or develop new stores in Western Europe. The company also has a 42% common equity interest in PS Business Parks (NYSE: PSB), a publicly-traded REIT that owns/operates 28 million square feet of rentable commercial space, and equity in earnings from PSB was $89.4 million in 2018. Among the largest U.S. REITs, Public Storage has one of the highest credit ratings of A2 by Moody’s and one of the lowest debt/capitalization ratios of less than 5%. The self-storage industry has been performing well over the last decade, with revenue growth and occupancy rates at historically high levels. However, supply has increased by 90 million square feet over the last several years, because plenty of new self-storage facilities flooded the market due to the favorable economics of new development. Management notes that supply has stabilized over the last several quarters, however, and is confident that the company can further increase its market penetration. The operational performance in the West Coast ex-Portland hasn’t been negatively impacted by supply additions either. And management expects the major U.S. metropolitan areas like LA, New York or Boston to perform well in 2019. The self-storage industry is resilient and can perform well during both cyclical/anti-cyclical times. When there's high economic growth people tend to move a lot and use storage to keep their stuff during the process. On the other hand, in times of recession, people tend to downsize their homes and rent storage to keep their extra stuff. The company has a high market share in major metropolitan areas like LA, NYC, and Chicago which helps it to build greater brand awareness. That also makes it well positioned to benefit from vast urbanization and migration trends of the major metropolitan areas as smaller available living spaces lead to a greater demand for self-storage facilities. The company has developed and expanded self-storage space for a total cost of $1.2 billion, adding approximately 11.3 million net rentable square feet between 2013-2018. As of Dec. 31, 2018, it had around $607.4 million in a pipeline of development projects, and management is highly optimistic about the brand new generation type product that can build it for a multiple lower than current price on the market. Redevelopment is an important part of future growth as management anticipates to expand or make more profitable well-performing assets. Development of new assets is slightly negatively impacted by the increasing land and construction costs in major markets. Management is satisfied with the current performance of developed assets that were financed by issuing of preferred shares over the last 3-4 years. Some investors would like to see the company take advantage of lower interest rate environments and take on additional debt in the past. For instance, with debt financing, the company could get a 3-5% interest rate, but instead, it issued preferred shares at 5-7% coupon rate over the last several years. As of Dec. 31, 2018, the company had $1 billion of U.S. dollar notes and 342 million euros of euro-denominated senior unsecured notes as well as a $4 billion in preferred shares outstanding. The company has a very strong capital allocation strategy and has acquired a total of 296 facilities with 20.6 million net rentable square feet for $2.7 billion between 2013-2018. It usually takes around 24 months for newly acquired assets to achieve its full potential. At the moment, there's elevated stress on the market that offers plenty of assets at reasonable valuations. Therefore, management notes to become more aggressive in 2019 and already is tracking plenty of interesting deals that are valued less than $100 million and would enable the company to have a greater presence on the key markets. During the most recent earnings call Public Storage provided capex spend guidance of $200 million or up 40% Y/Y, driven by investments in enhancements to the existing products and development program. About $100 million will go into generation five products are the most important project in the pipeline, as the company is trying to improve costs and assets efficiency. For example, it finds a dominant orange color more compelling to the customers and a paperless environment with a webcam that enables use of space in a more efficient way. The company can improve its operational efficiency by implementing solar solutions and internal/external LED that lowers water usage. 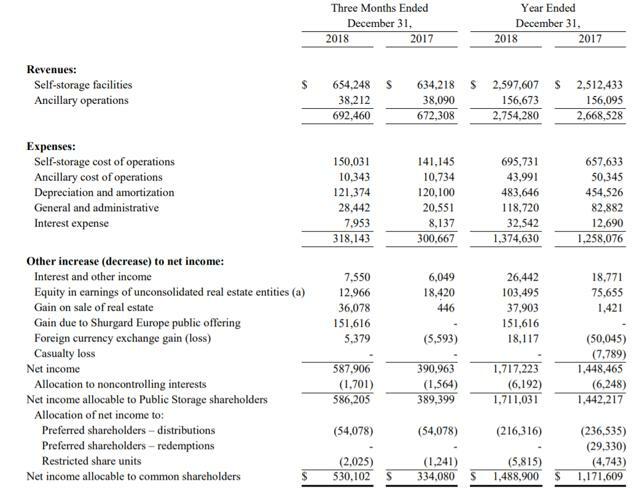 The company reported total self-storage and ancillary revenues of $692.4 million in Q4 18 or up 23% Y/Y, slightly higher than the analysts’ estimate of $690.8 million. FFO per share was $2.77 in FY 18 or up 2.6% Y/Y and $10.45 in Q4 18 or up 7.7% Y/Y. Net diluted EPS was $8.54 in FY 18 or up 26.9% Y/Y and $3.04 in Q4 18 or up 58.3% Y/Y. It was positively impacted by Shurgard Europe’s initial public offering, favorable FX related gains associated with outstanding euro-denominated debt, and a $47.1 million increase in self-storage net operating income. On the other hand, share-based compensation expense accruals for former executives were a major contributor to a $36.1 million increase in G&A expense Y/Y. 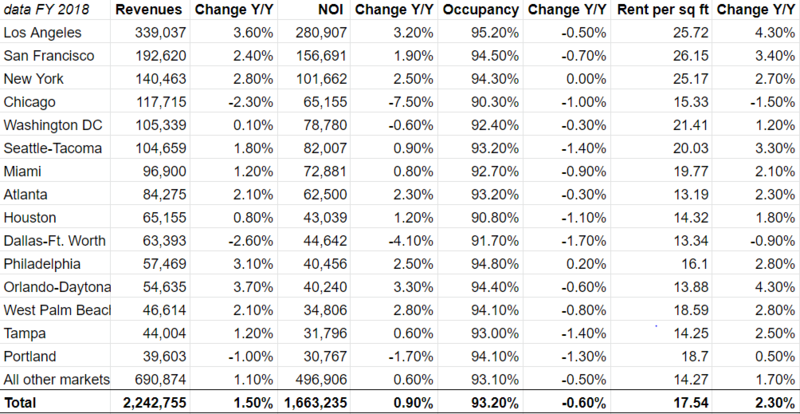 Total occupancy rate was 93.2% in FY2018, down 60 bps Y/Y, while occupancy was down 60 bps Y/Y to 94.7% in the top 3 US cities by revenue. Total realized rent per square foot was $17.54, up 230 bps Y/Y and up to $25.5, or 345 bps for the top three US cities. 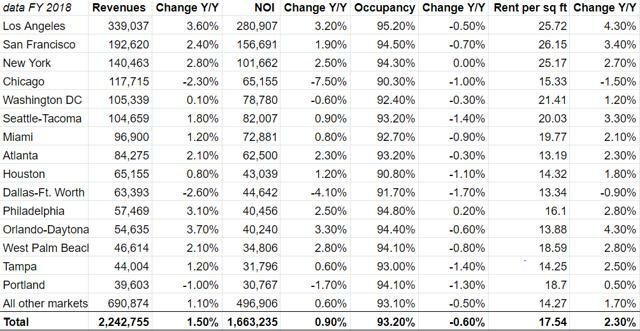 Given the fact that the occupancy rate was down Y/Y, the major contributor to the total net operating income growth of 0.9% Y/Y was increased realized rent per square feet Y/Y. Even though move-in volume is negatively impacted by increased supply addition throughout the U.S., the net tenant number is still growing due to the lower move-outs volume and an increased average length of stay. That is the key growth driver of rent revenue and the company is unsure whether particular positive customer trends could continue in 2019. The company will maintain annual rent increases around 8%-10% per year to existing tenants that usually tolerate rent increases. Throughout 2018 the company benefited from consistent sticky existing customers and has experienced positive customer response from the advertising spend to attract customers with lower move-in rates. The key driver was paid search spending as management put a strong emphasis to build strong brand awareness online. It also will try to stimulate move-in volume by offering promotional discounts to new tenants and increasing online marketing spend. For instance, month-to-month pricing offers great flexibility to adjust rents relative to the increase/decrease in expenses. In the case supply growth continues to exceed demand growth in the near future, that will most likely trigger a drop in the occupancy rate. The company will have a hard time to offset this occupancy drop by increasing its rents and will most likely end up with a significantly lower net operating income. The company didn’t provide any guidance for Q119 or FY2019, but consensus analysts estimates call for AFFO of $9.73 in 2019, a decline of $0.03 from 2018. Public Storage is currently trading at a trailing P/AFFO ratio of 22.5. That's slightly above its normalized P/AFFO ratio of 22. With no growth, therefore, investors should be content with the dividend yield of 3.6%. A massive supply on the market might start to negatively impact the occupancy rate and lead to the business slowdown. Global macroeconomic headwinds, FX fluctuations, and rising interest rates in the U.S. Competitive pressures from self-storage operators and other storage alternatives. The Hughes Family currently holds 15% of shares and could take adverse actions to other shareholders. Euro-denominated debt is prone to the risk of any rapid interest rate changes in the U.S. or EU over a short period. A higher number of longer-term tenants might fail to pay their obligations or decide to move out. Higher costs of steel and lumber – the main raw materials needed for construction of self storage facilities. We believe that the company is fairly valued at the moment and will have to offset competitive pressures to achieve stronger operational performance. The self-storage industry is labeled by high margins due to low operating expenses. For example only one employee can run a +10,000 square feet facility combined with low utility costs. Management expects that the generation five products can even further improve costs and operational efficiency and differentiate the company from the other new products/alternatives on the market. Increased market supply hasn’t negatively affected the business performance of the company so far because of its strong brand presence on the market and increased digital marketing spend to bring new customers. The company has an investment-grade balance sheet, less than 5% debt/capitalization ratio and an interesting development pipeline that can drive revenue growth and margins expansion over the next several years. Key risks, however, remain a global macroeconomic slowdown, the increased market supply of self storage near the major urban population centers and a drop in the occupancy rate. PSA is a steady self-storage play that pays a decent but not great dividend yield. In the event of a recession, the company should do well as consumers downsize or move. If the economy continues to expand, even at a slower pace, investors must be content with a 3.7% dividend and minimal upside price appreciation – although dividend boosts are certainly possible. Analysts forecast a dividend of $8.12 per share in 2019 and $8.53 per share in 2020. That is a 1.5% boost in 2019 and a 5% increase in 2020. We currently hold PSA in our Low Vol REIT portfolio but would not suggest adding to positions at these levels and not until there is a meaningful pullback in the price or an upside surprise to FFO and AFFO. For readers forecasting an imminent recession, PSA would be a good addition to the portfolio as a recession-resilient – but not recession-proof – business model. The stock price held up quite well in three out of the last four recessions. The one exception was in 2008-2009 when the stock declined 37%. The stock subsequently outperformed the S&P 500 Index by more than double from March 2009 to April 2016. Disclosure: I am/we are long PSA. I wrote this article myself, and it expresses my own opinions. 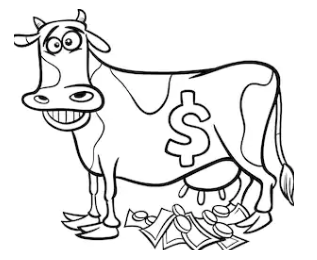 I am not receiving compensation for it (other than from Seeking Alpha). I have no business relationship with any company whose stock is mentioned in this article.